Link building is an integral part of SEO. Your page ranking and traffic will improve depend upon the number of backlinks you have. At the same time, a website authority will decrease according to the number of external links it gives. So if you really want to become a successful blogger or a website owner, pay more attention to external links. They are considered as the symbol of your love to an outside content. In other words, you are transferring the traffic you get, to another site by linking them from your content. But you can’t avoid linking in most of the cases. You have only one solution, to overcome this situation. Add Nofollow attribute to the desired link. It tells search engines that you are not in favor of that link, so do not pass your traffic or boost their rank. You have to repeat this process, whenever external links appear in your contents unless you got any mode of benefit for that. WordPress doesn’t allow you to insert Nofollow link automatically. This’s the normal popup screen you will get there to insert a link. So you have to go to HTML section of a post or page to convert it to Nofollow. It will be difficult especially if you are making a big lists post. This’s a simple plugin to configure all your external links. Don’t bother about any complex settings. Just install and forget it. When you are going to insert a link, will see this kind of window. Add a title for your link, text to display and put a tick mark on the second box to not follow the link. To confirm, go to the text screen. The following code can be recovered from there. Congrats. You have successfully placed Nofollow tag and the said link won’t affect your blog adversely. 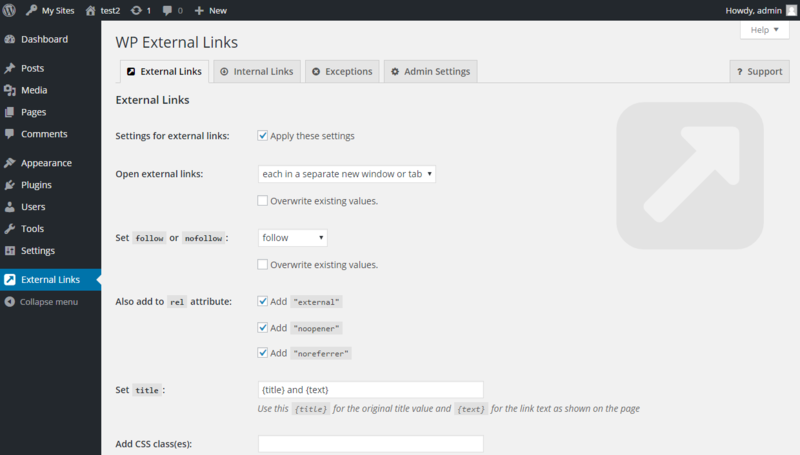 WP External Links is another popular plugin in the category. It lets you customize internal and external links in various ways. A number of tags can be assigned to your links- follow/nofollow, nopener and norefferer. If you are a multi-site owner, other sites can be excluded from the plugin’s default settings to assign Dofollow links to them. External Links is useful to configure outbound links in posts, pages and widgets. Install and go to Settings > External links to customize the plugin. 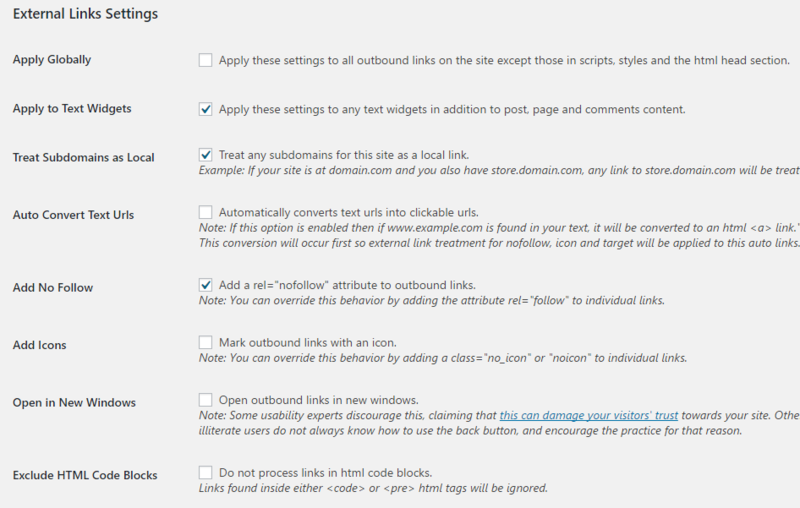 Check the first box, to apply settings to all external links on the site. You can apply nofollow attribute to text widgets, make all internal links Dofollow, automatically convert text URLs into clickable links, exclude HTML code block from the settings, by selecting the relevant options. You can exclude specific sites from the processing as well. Unlike above said plugins, it masks your outbound links in posts, pages, comments and RSS feeds to make them internal or hide. So search engines will treat them like internal links in the site. It also allows us to place Nofollow tag for such masked external links. 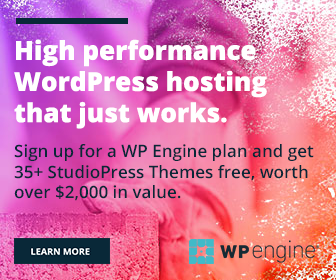 The plugin doesn’t change your links anyway, they are still usable and clickable. It will automatically insert rel=nofollow tag to all external links in your site. It is a simple plugin, need not configure anything more. Go to plugin settings, put a tick mark on ‘Apply nofollow to menu’ option. Add domains if any, to the excluded list. That’s all. The plugin will do the rest of the things.